City of Heroes was always intended to be a fun game, easy enough for anyone to pick up and start saving the planet as a Hero or plotting nefarious schemes as a Villain within minutes of logging in the game. So much so, that not only did City of Heroes appeal to comic book and superhero fans, but women and younger players as well. So what do you do when you already have a game that has nearly unlimited potential for character customization, an easy playstyle, and seven years worth of content, features, and stories? Simple. You take a big fat stick of dynamite to the barriers of entry. No disk? No problem. Download the game using our new Quick Downloader and be in the game in just a few minutes creating your character. What's a Quick Downloader? Download the installer, and run it. The game starts installing and within around five minutes, you can actually load the login screen and sign in. While you are creating your character, it's downloading the tutorial for you. By the time you're done with the tutorial, the first zone is probably ready. It's not constantly streaming in the background, but rather it downloads chunks as you need them (like starter zones, for example). This is new functionality we can now offer thanks to the new NCsoft Launcher. So what next? Let's create that character! We have a series of pages that guide you through choosing your Origin (what made you a super), your Archetype (Dominator? Blaster? ), your Primary and Secondary Power Sets (what you hit the bad guys with), and--of course--your costume. If you're really dedicated, you can go so far as to customize each power within your Power Sets! 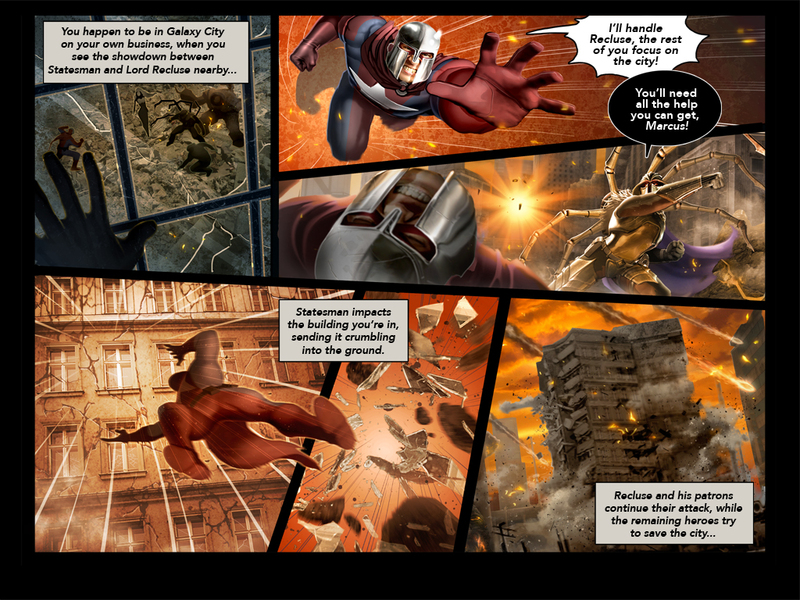 You want to give City of Heroes a try, but funds are tight? Play for free! You can play all the way up to Level 50 without paying a dime. What if you've played before, but now that we're going to a hybrid model, you're afraid you'll be stuck alongside the unwashed masses? Never fear, we remember you! You may not be a VIP player, but you are a Premium player to us, which means that you already have benefits just by having played our game before. But what if you're new to the whole Hero thing? What if the only thing you know about crime fighting is what you learned by watching blockbuster movies at your local movie theater? Not only that, seven years of content and features and knowledge is pretty daunting! And what on earth is a "tank" or a "crowd controller"? Don't worry. We got you covered. Our awesome character creator has been overhauled to be visually easy to move through. 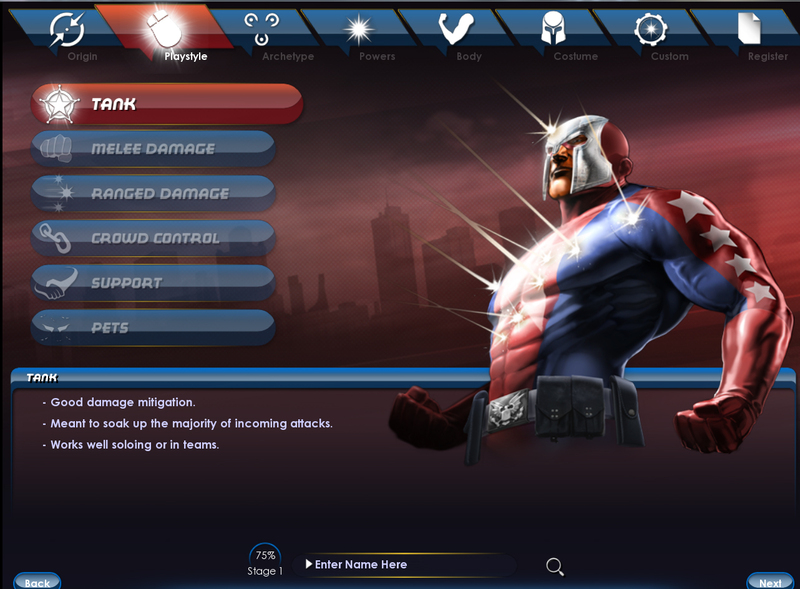 For people who are unfamiliar with the superhero genre, there are big beautiful images accompanying a new (optional) screen called Playstyle that tells you what a tank is (someone who can take a serious amount of punishment) while at the same time introducing you to some of our signature heroes from the game and giving you an easy-to-read bar (if descriptions aren't your thing) to see what each playstyle's strengths and weaknesses are. You can also track the status of your client download and installation at the bottom. Okay, fine, but seriously, if you have to go through another tutorial where you spend five hours reading and having to search forums to find out where the exit is, you'll scream, right? Done and done. The new City of Heroes Freedom™ tutorial is meant to be a ride in an amusement park: fast-paced, exciting, and over so quickly that you're on to your next adventure within minutes. We want to show you how to play, but we give you just enough to get you started (like showing you how to move, fight, and talk to contacts). Through voiceovers and simple popup help images, we provide straightforward instruction, and you let your powers and imagination do the rest. Our game lets you play as a Hero or a Villain, but we don't force you to choose before you even start playing. Not only that, you have access to nearly all our Power Sets early on. Once you've created your character, you have the option of reading a comic-book style load screen explaining how you wound up in a destroyed metropolis called Galaxy City during an invasion from aliens called Shivans who are trying to level the place further. With a little help from your cell phone and the masculine voice on the other end, you make your way through the carnage to a fallen Hero. Your decision at this point determines whether or not you're a do-gooder or a plot-hatcher. It's called a moral choice, and you'll definitely know it when you see it. Not only that, but whichever path you choose, the game adjusts in subtle ways to showcase your new alignment. And it just wouldn't be an epic superhero tale without a giant monster at the end that you and your newfound friends fight together to take down. Whew! All that in just a few minutes? Yes. Once you've left the remnants of the destroyed city, heroic types make their way to Atlas Park while villainous types stalk the streets of Mercy Isle. Here, they begin new adventures with new Contacts who introduce them to the story of City of Heroes. This is where you can start your own story. Are you a tortured axe-wielding poet with a penchant for black? Or are you a knuckle-cracking maniacal egghead with a soft spot for puppies and a keen sense of electrical energy? Our stories, powers, and extreme customization are here to help you tell your story. We want to teach you our game, but we want to do so in a fun and engaging way, so rather than cram it all into the tutorial (which we couldn't possibly do anyway), we created ongoing training missions. These missions are for Heroes and Villains, they start at Level 5, and span all the way to Level 19. Rather than force you to endure a never-ending information grind of pure data across 14 levels, we opted for an engaging approach. You're introduced to a Contact (our version of quest givers) who has noticed your street savvy awesomeness and is considering asking you to join a club. Heroes are approached by Twinshot who has heard some good things about them and may be interested in recruiting them into her group, the Shining Stars. Meanwhile, Villains may have distinguished themselves enough to catch the shifty eye of Dr. Graves, who is running a competition of sorts for a clan called the Hearts of Darkness. It is through these missions that we use simple tasks, teaming up with these new friends in missions, and traveling around Paragon City™ or the Rogue Isles™ to teach and inform. Again, these are optional, but they're a lot of fun and well worth the investment of time. If all that isn't enough for you, and you're entirely confounded and need some live help, when you leave the tutorial and enter one of your two starting cities, we have introduced something called the player help system that allows you to optionally flag yourself as new. If you choose to do so, you're added to the Help chat channel and your name is flagged a different color so that people know you're a novice. Ask your question to the Help channel or maybe a Mentor (flagged with a Helper color), who will strike up a conversation. Thanks for reading. Don't forget to tip the waitress on your way out.